Weng Bagadion is the Founding President of the Creative Economies Council of the Philippines (2011 to present), a non-profit private-sector-driven umbrella organization of IT-enabled creative industries including animation, game development, interactive media, audiovisual (film, television, music, post-production), design, publishing and print, and advertising. 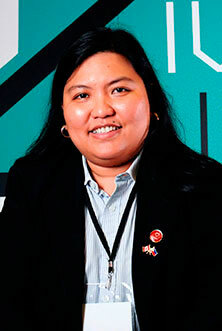 She was former President of the Animation Council of the Philippines (2009-2011), and member of the Board of Directors of the Business Processing Association of the Philippines (2009-2011). As an industry leader, Weng represents the Philippines in various international fórums and initiatives, particularly those relating to digital creative content. Beyond her advocacy work, Weng is a serial social entrepreneur and the Philippines’ foremost expert in e-learning and e-publishing. She is currently the Chief Executive Officer of Mediamatics, a 13-year old multinational company that provides digital creative services to the English- and Spanish-speaking markets of Asia, North America, Latin America, and Europe. Mediamatics also provides consulting services to investors and venture capitalists seeking to do business in the Philippines and in Colombia, where the company operates its two backrooms.